In a surprising move, Hay’at Tahrir al-Sham gave control of the strategic town of Khan Shaykhun to Jaish al-Izza, the Free Syrian Army’s local faction based in the area. North of Khan Shaykhun, Jabhat Tahrir Suriya captured Hish and Babulin, eroding the HTS supply line to its positions in northern Hama. Harakat Nour al-Din al-Zinki seized more areas west of Aleppo. The increasing distance between the Anadan plains and HTS lines helped cause HTS fighters there to defect, although they have not announced a defection to another faction or the formation of a new one. The willingness of HTS to give up large towns under its control indicates that it is willing to sacrifice territorial control and prestige in order to secure its long-term survival. This is a key feature distinguishing it from ISIS, which could not stand to lose a single town without putting up a fight for it. These conciliatory gestures show HTS leaders understand power politics and realize when they are in a fight they cannot win. 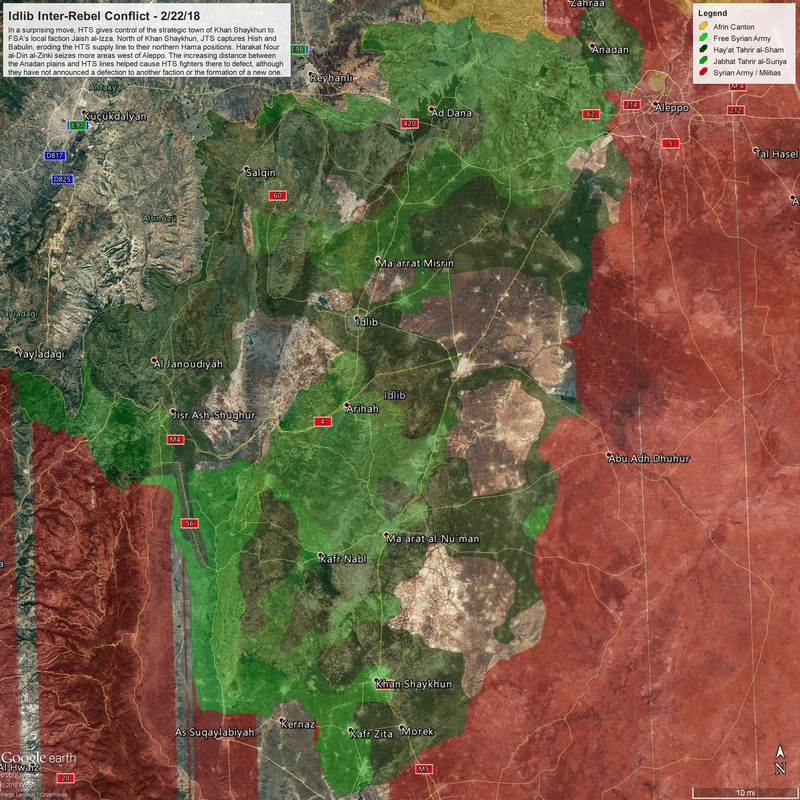 It is quite likely that HTS will retreat to its strongholds in western Idlib regions of Salqin, Darkush, and Jisr Shughour in an effort to regain its strength and prepare itself for future actions against any possible opponents. Turkey will likely permit it to do this so long as it does not interfere with Turkish activities or allies in the area.